Click here to view this week’s harvest ticket! The variety we grow is from Guatemala, and I think the best of all that we’ve trialed…at least for Southern California. 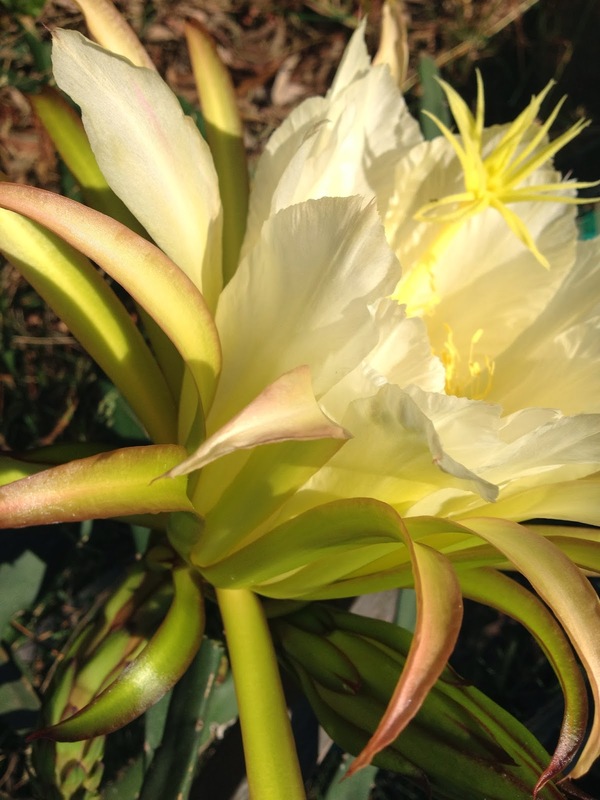 Grown as a trellised cactus, the fruit is spineless and has a rich, floral taste that is hard to describe. I like them best when thoroughly chilled. The flowers are spectacular and open for a single day. We’re in the midst of our pineapple guava harvest. For the first few weeks I labeled the bags because so few have seen the fruit in the store. Now I’m saving the effort, and just relying on this blog for identification purposes. Even if you don’t enjoy the fruit (although they are among my favorites) the scent as they ripen in your kitchen is enough reason not to give them away. Limes are back at last, which to me are a kitchen staple. I use the juice in my salads, add to smoothies and juice mixtures, and have several recipes for sauces. We’re planning a Farm Day shortly, and will announce here. 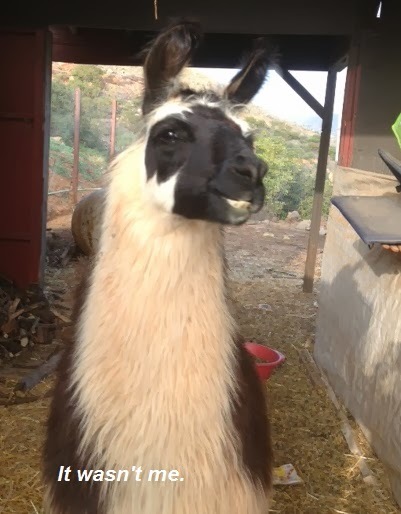 We have persimmons for everyone this week, although the harvest would be twice as bountiful if Couscous the Bad Llama hadn’t discovered a taste for persimmons this year. He ate just about half the crop. We’ll put a low fence around the trees for next year so it won’t happen again. I don’t know why he chose this year to discover the fruit, he’s had access for many years. Come on out to Morning Song Farm for our beginning cheese making class. 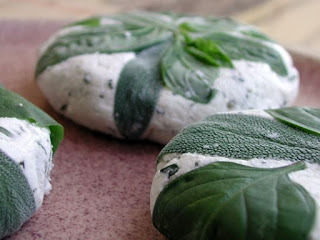 We’ll focus October’s class on a few of the fun and easy cheeses that will easily turn you into a cheese maker! Impress your friends with cheesey offerings and try out a fun and different hobby that brings dividends of appreciation. You may find that you’ll discover a passion for cheese as we have here at Morning Song Farm. It’s easier than you’d ever think! Follow along with handouts and easy to follow recipes so that your success is insured when you repeat the steps at home. We’ll talk about which milk to use, cultures, and why certified organic milk isn’t always your best choice. We’ll make three different cheeses; Garlic Ricotta, Herbed Queso Fresca, Fromage Blanc, Paneer, Feta and Neufchatel cream cheese are among those we choose to make and sample during the class. Class starts at 9:00. Arrive 15 minutes early if you’d like, to sample herbed cheeses as well as our just churned butter and freshly milled-macadamia muffins. Warm up with hot coffee or herbal tea or enjoy freshly squeezed orange juice while meeting your fellow cheese loving adventurers! Get a chance to meet the farm’s beautiful Nigerian dairy goats, and pet our friendly herd. Bring a crunchy granola bar or two and you’ll be everyone’s best friend, especially Carl The Herd Leader who eats anything but really gets excited if it’s crunchy. Tuition: Even if you are a much appreciated farm member, payment and reservations for our cheese classes need to be made here so that we can use the Meetup software to keep an accurate headcount. Please, no impromptu arrivals. The class size is limited for a reason, so we need to have firm reservations. Our barn is now heated, but do come with a sweater just in case. The pathway to the barn is rough and unpaved, so stash the stilettos or dress shoes; and opt for sneakers or boots for your cheese making day. Donna Buono, who learned many homesteading skills such as cheese making from her grandmother, an astrophysicist with NASA — has always had a desire for rural living. As a child, Buono and her family of five spent the summers camping on her uncle’s Maine farm in a 20-foot trailer, giving her the conviction that she’d rather live in a shack on acreage than a mansion in the suburbs. Fast forward to now and you will find Buono on her 20-acre organic farm in the small town of Rainbow, in the northern part of San Diego County. What started out as a “hobby” in 2001 is now Morning Song Farm, which grows 70 different fruits, macadamias and heirloom vegetables. The farm is a CSA (Community Supported Agriculture), and has drop-off points throughout San Diego and Orange counties for its customers to pick up weekly baskets. CSA is sometimes referred to as a “subscription farm” because the consumer buys a subscription from a farmer for a set price to receive fresh produce on a weekly or bi-weekly basis. Morning Song Farm is one of about a dozen CSAs in the county. Morning Song Farm is known for its rare fruits and vegetables, such as mulberries, pineapple guavas, dragon fruit, and Purslane, a leafy green high in omega-3. More than half of the farm is covered with 700 macadamia trees. A recent weekly Morning Song Farm basket was packed with kale, royal purple beans, cucumbers, beets, passion fruit, pomegranates, green onions, parsley, basil, tomatoes and Purslane. 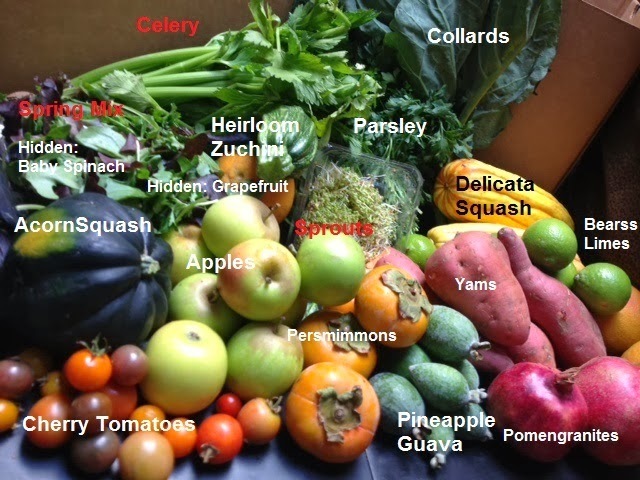 A small CSA box from Morning Song Farm costs $34.50, weekly or biweekly; and a large box runs $44.50, weekly or biweekly. A box of salad fixings goes for $19.75 a week. Morning Song Farm, which is mostly family-run, has one part-time and one full-time employee. Buono, known as Farmer Donna, is a staunch food advocate, but will be the first to admit that passion aside, organic farming is a tough business. The Chula Vista native talked to U-T San Diego about the challenges and jubilations of owning and running a small organic farm. Q: What was your motivation behind buying a farm? A: My original vision was to grow passion fruit and fioja guavas, two underappreciated fruits that I really love. It was supposed to be a hobby. But I realized you can’t run something like this and make it just a hobby. As I started out at the Santa Monica farmers market, it became clear that two mostly out-of-season items on the table wouldn’t even pay the water bill. I wasn’t really thinking in terms of return on investment. I did follow my passion and have ended up doing something I love. In terms of ROI there are probably more lucrative industries to devote one’s life to, so for the young farmer just starting out, I would say that you need passion to get you through the rough times and the unprofitable years. Q: Why did you choose to become a CSA? A: I was doing farmers markets, and I love them, but economically it just didn’t pencil out for us. At the end of the day once you pay your employee and pay for gas, you don’t make anything. The CSA model turned out to be great for a mom like me. I didn’t have to work weekends at all anymore, which was life-changing. With farmers markets, the farmer never knows how much to harvest; rain or a sporting event can change sales figures substantially. We gave or threw away a lot of food. With a CSA, you only harvest for the exact number of boxes you are preparing for your subscribers. We started the CSA with a single friend of mine who had admired the beautiful produce on my kitchen counter. She and I shared in the cost to grow a vegetable garden, and we split the produce each week. Several other girlfriends joined in soon after, and we were off. Soon friends of friends asked to join. The chickens at Morning Song Farm like to hang out in the macadamia trees at night. Seventy fruits, vegetables and nuts are grown on the 20-acre organic farm in North County. Q: What are the challenges of marketing a CSA to consumers? A: We don’t do a lot of marketing. We use Susco Media’s Z Code Magazines to get the word out a little bit. We also advertise in the two local newspapers. For small farms like mine, getting the word out can be an issue. Advertising is expensive. A majority of San Diegans who want non-GMO organic foods in their homes are still not aware of CSAs. Every single local organic farm should have a waiting list and should be maxed out. That’s not happening yet. There is no strategy for strong growth. We haven’t had much growth in years, and have had about the same number of subscribers. Q: What have been some of your biggest challenges? A: As a small farmer I think talented labor is a huge issue. So much of our farming knowledge was coming from Mexico, and then there was a crackdown on labor laws and immigration issues. Immigration laws changed the face of farming in California. It’s been said that it takes at least 20 years to know what you are doing in farming. That knowledge base is precious. Current California law also states that farm internships are noncompliant. That’s a problem industry wide. The average age of a farmer in California is 60, which is scary. Where are the young people just starting out supposed to learn? We have a knowledge base that is not transferring as fast as it needs to. And many small family farmers aren’t expecting their children to continue the family farm, because the kids see firsthand the economic trade-offs that are involved and decide to do something else. Q: How do you deal with profit pressure? A: We’re profitable most months, but we would be much stronger by simply increasing our CSA subscriber base. We have a much larger capacity for production than we are utilizing. We’re considering adding macadamia tours, a farm experience bed-and-breakfast, a sprouting class, and more cheese classes to diversify our income base and increase exposure. Q: What fuels you to get up before dawn every day to farm? A: I really believe in myself and I think I can do it. Healthy food should not be considered a luxury. I have an infectious passion for amazing fruits and vegetables. Many of our subscribers say they feel like it’s Christmas when they open their boxes every week. Hobbies: Fixing up her old farmhouse, taking care of her llama and goats, hiking and jet skiing. Morning Song Farm is one of about a dozen Community Supported Agriculture farms in the county. The consumer buys a subscription from a farmer for a set price to receive fresh produce on a weekly or biweekly basis. Cost: A small box is $34.50, weekly or biweekly; and a large box runs $44.50, weekly or biweekly. Sample contents: Kale, royal purple beans, cucumbers, beets, passion fruit, pomegranates, green onions, parsley, basil, tomatoes and Purslane. I’m really excited about the new things that are successfully growing, such as our dragon fruit, olives, and sapote. We’re just starting a trial of carissa plums. It’s a lot of hard work and most of my customers are aware of that. I also have a blog, and love to tell our farm stories. We recently started a cheese-making class here, which is another way to get people interested in the farm and in great food. We’re now providing a link so that everyone can read our harvest ticket regardless of platform used. Please let us know if you encounter difficulties. I’m excited to use Dropbox, because when the need to revise a Harvest Ticket comes up, now it’s feasible! The old way with going from Word to PDF to Gif and then downloading half a dozen gifs and then fighting the Blogger software to get them to download sequentially was so cumbersome, an omission on the ticket had to just be ignored. Now we can revise easily!